Rite Aid Corporation (NYSE: RAD) today announced sales results for August. For the five weeks ended Aug. 29, 2015, same store sales increased 1.6 percent over the prior-year period. August front-end same store sales increased 0.6 percent. Pharmacy same store sales, which included an approximate 222 basis points negative impact from new generic introductions, increased 2.1 percent. Prescription count at comparable stores decreased 0.3 percent over the prior-year period. Total drugstore sales for the five-week period increased 1.6 percent to $2.546 billion compared to $2.507 billion for the same period last year. Prescription sales accounted for 69.6 percent of drugstore sales, and third party prescription sales represented 97.9 percent of pharmacy sales. Same store sales for the 13-week period ended Aug. 29, 2015 increased 2.1 percent over the prior-year period. Front-end same store sales increased 0.3 percent while pharmacy same store sales increased 2.8 percent. Prescription count at comparable stores increased 0.2 percent over the prior-year period. Total drugstore sales for the 13 weeks ended Aug. 29, 2015 increased 1.9 percent with sales of $6.602 billion compared to $6.477 billion for the same period last year. Prescription sales represented 69.3 percent of total drugstore sales, and third party prescription sales represented 97.8 percent of pharmacy sales. Same store sales for the 26-week period ended Aug. 29, 2015 increased 2.5 percent over the prior-year period. Front-end same store sales increased 0.5 percent while pharmacy same store sales increased 3.4 percent. Prescription count at comparable stores increased 0.9 percent over the prior-year period. Total drugstore sales for the 26 weeks ended Aug. 29, 2015 increased 2.3 percent with sales of $13.205 billion compared to $12.902 billion for the same period last year. Prescription sales represented 69.2 percent of total drugstore sales, and third party prescription sales represented 97.8 percent of pharmacy sales. 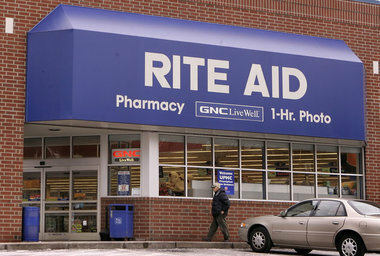 Rite Aid is one of the nation’s largest drugstore chains. On Aug. 29, 2015, the company operated 4,561 stores compared to 4,572 stores in the like period a year ago. Information about Rite Aid, including corporate background and press releases, is available through the company’s website at http://www.riteaid.com. Note that all sales data in this release is preliminary, unaudited and subject to revision.